With Whitsun holidays fast approaching, for many of us it represents a well-deserved time off on the last Monday in May. 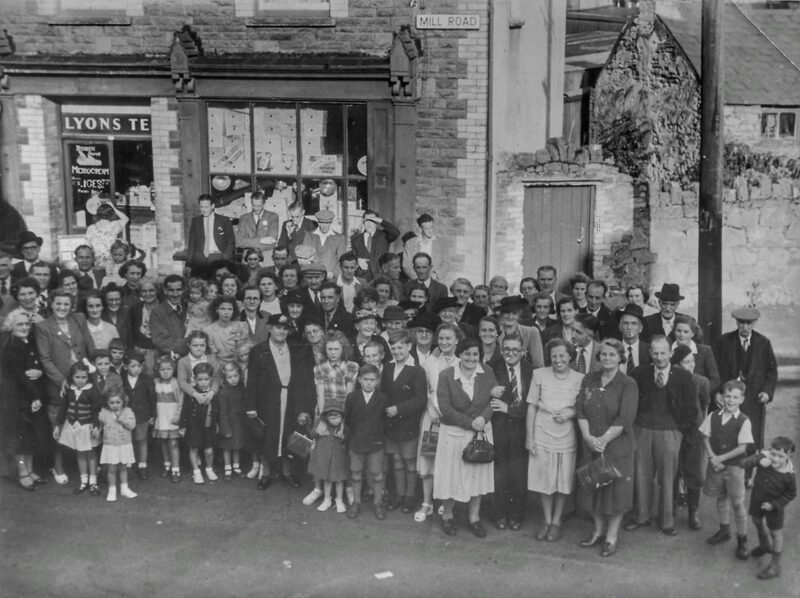 However, in Tongwynlais in days gone by it was a huge celebration. I started asking questions of a few local people and thought that it would be interesting to find out a little more and to share some of their stories. I would like to thank Tricia Dean, Linda Morgan, Carol Denton and Ruth Williams in particular for their input about the huge occasion that was the Whitsun break. Whit Sunday celebrates Pentecost on the 8th Sunday after Easter. Before 1972 the spring bank holiday coincided with this and the people of Tongwynlais enjoyed a three-day break full of festivities. 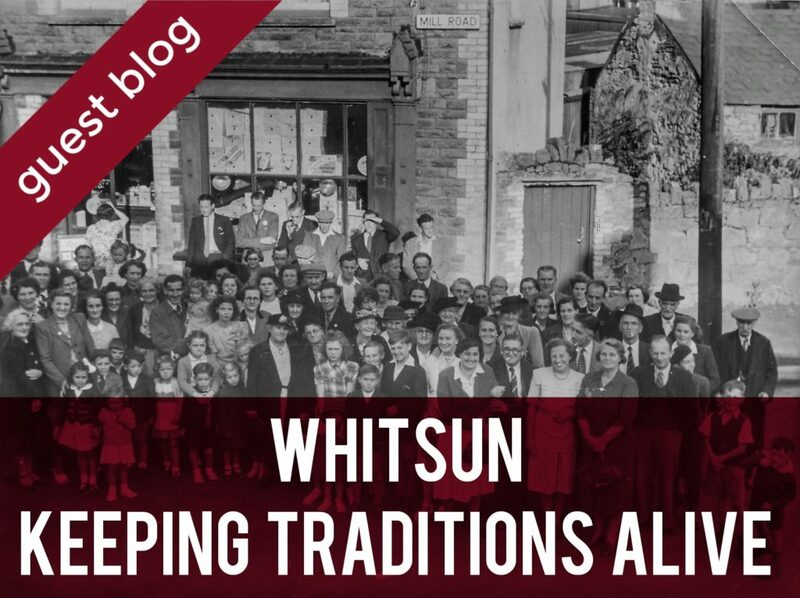 Many fondly remember huge celebrations on these Whitsun weekends, where they usually received a brand-new outfit and enjoyed a whole weekend of festivities including a trip somewhere for the day with the whole community. Families living elsewhere used to come back and visit for the weekend so that they could enjoy the celebrations too. Local village councillor Linda Morgan and Ruth Williams fondly remember how important Whitsun was in the village. In those days children had nothing, money was tight everywhere, you had Sunday best, school clothes and not much else. Children had nothing really compared to children nowadays. Whitsun was a huge occasion, almost every family in the community came out to attend and in those days, you were definitely in the minority if you didn’t attend a church. Children weren’t generally given Easter presents as Whitsun was when most children were taken shopping for a special outfit and it was as exciting as Christmas. Pontypridd market was apparently the place to shop for these new outfits, many female residents remember receiving a new dress, hat, shoes, socks and sometimes gloves on these shopping trips. The Whitsun march was the time you got to parade around the village and show them off. Tricia kindly sent me a few pictures of her with friends Lesley Lloyd and Meryl Evans dressed up ready for the “Whit” march. Since the march meant that they paraded around Tongwynlais, locals also spruced up their gardens for the event. A local garden enthusiast Danni lived at the top of Mill Road and locals used to visit him to obtain plants for their own gardens in readiness for the occasion. There were originally 5 churches in the village, St Michael’s, Ainon, Bethesda, Salem and Hermon and each of these probably had around 100 children attending Sunday school. So this amount along with the children’s families attending the Whitsun celebrations, made it a whole village affair. Everyone on the march would follow a band around the village and visit almost every street in Tongwynlais. On another day over the Whitsun break, children would participate in games on the recreation field. All the families would go back to their respective churches afterwards to finish off with a party style tea, sandwiches, ice-cream, jelly and most especially crisps. Linda fondly remembers crisps were a very expensive treat limited to one bag per week usually in her house on a Friday so to have them at the Whitsun party was a real treat. Another local resident Andrew, fondly remembers the Whitsun break usually meant a trip away for the children in the community, usually to Barry, Portcawl or sometimes even Weston Super Mare. With money so tight, it was a huge treat to all the children at the time. Linda had fond memories of one Whitsun arriving back from a shopping trip on the bus. Her father used to help Clifford Davies to canvas for the local elections using a loudspeaker whilst driving around the village. They all jumped into the car to have a lift home and her mum was asked by her father if she’d found everything she needed, to which she replied yes, then told him how much she had spent on the clothes, her dad exploded, and a heated “discussion” ensued – all of which was being shared with the village as the loudspeaker was still turned on! The Whitsun break altered from year to year and different residents, depending on their age, remember sometimes the games took place straight after the march, and sometimes on the bank holiday Monday. In the later years residents remember the Whitsun march procession went up to Castell Coch and the games and festivities continued up there. This tradition used to be widespread in Wales but unfortunately it’s declined as the years have past and may well have died out everywhere else. In Tongwynlais, however, the Whitsun march still exists and the local band lead people in procession around the village. Every year the churches in Tongwynlais work together to host the event. As this date is a time when many take advantage of the weekend break, numbers vary over the years. It would be great to keep this tradition alive and bring back memories for our older residents who may not be able to take part in the march any more but would love to come out into their gardens as their parents used to and watch the procession go by. Everyone is welcome, regardless of whether you attend church or not and don’t worry, you don’t have to dress up as the children used to, it’s a very casual affair nowadays. This year, on Sunday 20th May, church members and children from Ainon, St Michael’s and Bethesda along with local residents, children and visitors, will meet outside Ainon church on Market Street about noon. At approximately 12.15 we’ll set out with banners following the band, stopping at various points around the village. The procession will eventually head back to Ainon where there will be a get together and a barbecue to finish off. We would love you to join us and keep the tradition alive. Below is a little more about the history from an Ainon perspective. 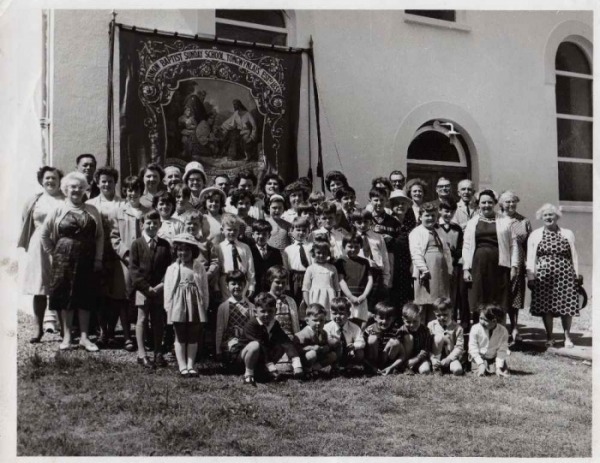 This picture shows the people at Ainon assembling outside the chapel in 1965 or 1966, before moving off to join the other churches at Queen Street for the start of the march. The picture below shows another popular Whitsun tradition, the Whitsun Outing. The churches of the village would organise a trip for the children of the Sunday Schools and their families (which was more or less the whole of the church), taking them to places like Barry Island, Porthcawl and Weston-Super-Mare. This picture probably shows the gathering before one of these trips in the early 1950s. The gent on the far left at the rear with the black hat is the minister, Rev. W. J. Morgan; the one in the black hat on the far right is the church secretary, Mr. E. Davies. We would love you to share your pictures, stories or fond memories with us about the Whitsun march. Please post them so that everyone can enjoy a little of Tongwynlais history. Editor – You can comment below or share on Facebook or Twitter. Use the contact page to send us a private message. Thanks to Tricia Dean, Ainon Church and BBC Radio Wales for the photos and video used in this article. I find the rich history and family roots that are here fascinating. That was great to read and loved the bit about the loud speaker! Some fascinating insights into what people got up to. Thank goodness the churches were around to make sure people had a way of celebrating their holiday weekends over the years!